We’re part of a future that thrives on Information Technology. IT powers businesses, keeps us connected, and facilitates the progress of tomorrow – but hard IT skills are no longer (solely) where it’s at. In an increasingly tech-savvy world, digital skills are in higher demand than ever before but candidates too often overlook the importance of soft skills. But these skills are just as important as tech skills to help land you the job and can often set you apart from the competition. Adaptability: Nothing changes and pogresses quite so quickly as the technology industry, so it follows that the people who inhabit this fast-moving market must strive for flexibility. IT pros cannot be precious with their work, projects can be scrapped at a moment’s notice, and the most in-demand professionals will be those who thrive on these challenges. 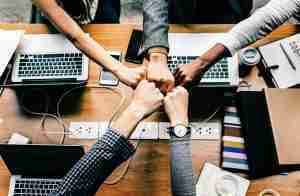 Collaboration: People are no longer confined to the office; employees are spread throughout the world and connected via conference/video calls. To navigate this new way of working, being able to pick up on social cues and collaborate accordingly is as valuable as the ability to code. Organisation: From developers to IT Directors, the remit of an IT professional is varied. Whether it’s to manage deadlines, meet targets or juggle assignments, good organisational skills are essential to the smooth-running of any IT project. Empathy: Organisations want employees who can connect with those around them – from colleagues to external customers. So as well as being able to diagnose a problem and remedy a solution, IT professionals have to harness a willingness to understand the issues of those around them. If you’re wondering why soft skills are so important, you need only look at the evolution of IT – from back-end function to a fully integrated business unit. Employers need IT professionals with good communication and collaboration skills, because they’re expected to work with a far greater section of the business than ever before. And while technical skills will look great on a CV and are a key requirement, it’s often soft skills that can stand as the ultimate differentiator. So while technical/digital skills are undoubtedly essential in the workplaces of today, the people who stand to make the most notable difference are those who will embrace and demonstrate their softer skills. Without that, we really could be a world run by robots.